Step 1 : Read the question carefully and visualise the situation (think as if the process is happening in front of you). Step 2 : Draw a relevant figure and write the parameters given. Step 3 : Make sure all values are in the same set of units. Step 4 : Plan the concept/ formulae which are to be used. Step 5 : Avoid doing calculations in each step. Try to do all the calculations at final step to save time. Question 1. A motorcycle of mass of 2000 kg is moving over a horizontal road, with uniform velocity. If this motorcycle has to be stopped with a negative acceleration of 1.5 ms–2, then what is the force of friction between the types of the motorcycle and the road? Here, m = 2000 kg; a = – 1.5 ms–2; F = ? Negative sign shows that force of friction (F) acts in a direction opposite to the motion of the motorcycle. Question 2. A constant force acts on an object of mass 5 kg for a duration of 2 s. It increases the object’s velocity from 3 ms–1 to 7 ms–1. Find the magnitude of the applied force. Now, if the force was applied for a duration of 5 s, what would be the final velocity of the object? u = 3 ms–1, t = 5 s, a = 2 ms– 2, v = ? Question 3. A bus of mass 5000 kg starts from rest and rolls down a hill. If it travels a distance of 200 m in 10s. Calculate (i) acceleration of the bus and (ii) the force acting on the bus. a = ? ; F = ? or a = 4 ms – 2. Question 4. The velocity-time graph of a ball m moving on the surface of floor is shown in figure below. Calculate the force acting on the ball, if mass of the ball is 20 g.
a = ? ; F = ? 5. The velocity-time graph of a ball moving on the surface of a floor is shown in fig below. Find the force acting on the ball if the mass of the ball is 50 g.
The velocity of the ball at t = 6s is zero. time, t = 6s ; F = ? Negative sign shows that the ball is retarded or decelerated. Question 6. An iron sphere of 1 kg is moving a velocity of 20 ms– 1 on a cemented floor. It comes to rest after traveling a distance of 50 m. Find the force of friction between the sphere and the floor. Here, m = 1 kg. ; u = 20 ms – 1; ; s = 50 m; F = ? Negative sign shows that the force is retarding force. Force of friction F = 4N. Question 7. A wooden block of mass m1 kg accelerates at 10 ms–2 when a force of 5 Newton acts on it. Another block of mass m2 kg accelerates at 20 ms–2 when the same force acts on it. Find the acceleration, if both the blocks are tied together and same force acts on this combination. Question 8. A car of mass 1000 kg moving with a velocity of 36 km/h hits a wall and comes to rest in 5 s. Find the force exerted by the car on the wall. Time, t = 5 s.
Question 9. A ball of mass 100 g moving with velocity of 10 ms – 1 is stopped by a boy in 0.2s. Calculate the force applied by the boy to stop the ball. 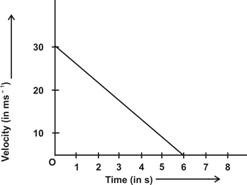 Time, t = 0.2 s.
Negative sign shows that force applied by the boy is the opposing force i.e. a force in a direction opposite to the direction of motion of the ball. Question 10. A car of mass 1000 kg and bus of mass 8000 kg are moving with same velocity of 36 kmh– 1. Find the forces to stop both the car and the bus in 5 s.
Time t = 5 s.
Negative sign with force shows that the force is applied in a direction opposite to the direction of the motion of the car and bus. Such a force is known as retarding force. Question 11. A body of mass 100 g is at rest on a smooth surface. A force of 0.2 newton acts on it for 5 seconds. Calculate the distance traveled by the body. Question 12. A gun fires a bullet of mass 50g. The bullet moving with a velocity of 100 ms– 1 strikes a wooden plank and comes to rest in 0.05 s. Calculate (i) the force exerted by the wooden plank on the bullet and (ii) the distance of penetration of the bullet in the wooden plank. F = ? ; S = ? Thus, force exerted by the wooden plank on the bullet = 100 N.
= 5 m – 2.5 m = 2.5 m.
Question 13. A mechanic strikes a nail with a hammer of mass 500 moving with a velocity of 20 ms – 1.The hammer comes to rest in 0.02 s after striking the nail. Calculate the force exerted by the nail on the hammer. = 0; t = 0.02s; F = ? Question 14. A bullet of mass 100 g is fired from a gun of mass 20 kg with a velocity of 100 ms– 1. Calculate the velocity of recoil of the gun. Negative sign shows that the direction of recoil velocity of the gun is opposite to the direction of the velocity of the bullet. Question 15. An iron sphere of mass 10 kg is dropped from a height of 80 cm. If the downward acceleration of the ball is 10 ms– 2, calculate the momentum transferred to the ground by the ball. Question 16. Two small glass spheres of masses 10 g and 20 g are moving in a straight line in the same direction with velocities of 3 ms – 1 and 2 ms–1 respectively. They collide with each other and after collision, glass sphere of mass 10g moves with a velocity of 2.5 ms– 1. Find the velocity of the second ball after collision. = 2.5 ms –1; = ? Now, according to the law of conservation of momentum. Question 17. Two bodies each of mass 0.5 kg are moving in a straight line but opposite in direction with the same velocity of 2 ms– 1. They collide with each other and stick to each other after collision. What is the common velocity of these bodies after collision? Let one body is moving towards left side and second body is moving to the right side. So velocity of the body to the left side is taken as positive and velocity of body moving to the right side is taken as negative. Thus, the combination of two bodies comes to rest after collision. Question 1. A cricket player lowers his hand while catching the ball. Why? When a cricket player lowers his hands, the time to stop the ball increases, so the rate of change of momentum decrease and hence less force has to be applied to stop the ball, due to less force the hands of the player are not injured. That is why, a cricket player lowers his hands while catching the ball. Question 2. A person falling on a cemented floor gets injured but a person falling on a heap of sand is not injured. Why? When a person falls on a cemented floor, the rate of change of momentum is very high because the person is abruptly stopped i.e. stopped in a very small interval of time. Hence the person gets injured due to the application of a large force on his body by to the floor. On the other hand, when a person falls on a heap of sand, the sand yields under the weight of the person. As a result of this, the person comes to rest in a longer period of time. So the change in momentum takes place at longer interval of time. Hence a small force is exerted on the body of the person when he falls on a heap of sand. Therefore, he does not get injured. Question 3. A bullet fired from a gun makes hole in the window pane while passing through it, but the stone striking the window pane breaks it into pieces. Why? In case of bullet, only a small portion of the window pane where the bullet strikes comes in motion because the bullet makes contact with the pane for a very short time due to its high speed. On the other hand, the remaining portion of the window pane remains at rest due to inertia of rest. Thus, a small hole is made by the bullet in the window pane. In case of a stone, the speed of the stone is very low compared to the speed of the bullet. So the stone makes contact with the window pane for longer period of time. During this long time, the whole window pane comes in motion and hence breaks into pieces. Question 4. Our hand hurts more when we hit the wall than when we hit a sponge seat of a car. Why? When we hit the wall with our hand, then the hand comes to rest in small interval of time. So large change in momentum of our hand takes place in small interval of time. Hence, large force is exerted on our hand. On the other hand, when we hit the sponge seat of a car, the seat yields and the hand comes to rest after long interval of time. So, the change in momentum of the hand takes place in large interval of time. Hence, less force is exerted on our hand. Question 5. A karate player breaks a pile of tiles or bricks with a single blow. How? When a karate player strikes the pile of tiles with his hands, he des so as fast as possible. In other words, the time taken to strike the pile of tiles is very small. As the momentum of the hand of a karate player reduces to zero when his hand strikes the pile of tiles in a very small interval of time, therefore, the rate of change of momentum is very large and hence a very large force is exerted on the pile of tiles. This force is enough to break the pile of tiles. Question 6. “Action and reaction are equal and opposite but even then they do not cancel each other.” Explain, Why? Two equal and opposite forces can cancel each other if they act on the same body. But action and reaction do not act on the same body. Action acts on one body and the reaction acts on another body. Hence they cannot cancel each other. Question 7. It is difficult to balance our body when we accidently step on a peel of banana. Explain. Why? When we walk on the ground, our foot pushes the ground in the backward direction (Action). On the other hand, ground pushes our foot in the forward direction (Reaction). This reaction of the ground helps us to move in the forward direction. But, when our foot falls on a peel of banana, then our foot slips on the peel of banana and cannot push the round in the backward direction. Consequently, no reaction force acts on our foot. Hence we lose the balance and fall down. Question 8. When a quick jerk is given to a smooth thick cardboard placed on a tumbler with a small coin placed on the cardboard the coin falls in the tumbler. Whey? The coin was initially at rest. When the cardboard moves because of the jerk, the coin tends to remain at rest due to inertia of rest. When the cardboard leaves contact with the coin, the coin falls in the tumbler on account of gravity. Question 9. Which has more inertia, a bicycle or a train and why? A train because of its large mass. Question 10. 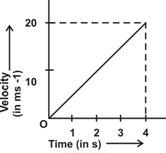 What type of force is acting on the body whose motion is shown in the following v–t graph. (a) Since the velocity is constant, acceleration is zero. Therefore no force is acting on the body. (b) This is a case of constant retardation. Therefore, a constant retarding force is acting on the body. (c) This is a case of constant acceleration. Therefore, a constant accelerating force is acting on the body. Question 11. A truck and car moving with same velocity come to halt after head on collision. If the collision lasts for 10 s.
(a) Which vehicle experiences the greater force of impact? (b) Which vehicle experiences the greater acceleration? (c) Which vehicle experiences the greater change in momentum? (d) Why is the car damaged more than the truck? (a) Since momentum of truck is more than the momentum of the car, because of its greater mass so the car will experience greater force of impact exerted by the truck. (c) The truck experiences a large change in momentum because its initial momentum is more than the initial momentum of the car. (d) The car gets damaged more than the truck because the truck transfer more momentum to the car.